It’s time to get ready for our dinner/dance tonight. 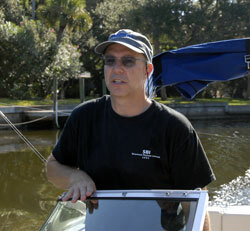 I just got back from a day on the water thanks to Larry Stults. Here’s Captain Stults taking Rich Wray and me out on the bay. Could we have better weather? No! I want to thank Larry for taking the day to go out on his boat. He and Nancy have just recently moved back to Sarasota from North Carolina.